"Marvin Washington believes in examples. " As a consultant, teacher and researcher he believes we can learn from examples: examples of people who have demonstrated leadership in prolonged and difficult situations; examples of organizations that have used well-defined strategies to lay the foundation for growth and success; and examples of those same organizations that have achieved greatness because their people were willing and able to change as needed. Marvin’s academic research focuses on the intersection of strategic management and organization theory. He concentrates on analyzing conflict at the institutional level, and seeking to understand how status and reputation can impact organizational success. He tends to use non-traditional settings such as the online gambling industry and college sports, and focuses on unusual populations such as Italian lawyers and football coaches. As a consultant, Marvin applies learnings from his research to help businesses and organizations grow productively, thrive culturally, and succeed in operational and financial management. His specialty is Action Research, through which he helps organizations solve real problems. His goal is to equip emerging and senior leaders with tools to be successful, and to help their organization’s achieve the desired results. Marvin is a teacher, researcher and consultant. He is also in demand as a speaker on the topics of leadership, strategy and organizational development. Some of his presentations are Lessons from the Wild Dogs of Africa: Creating a Winning Culture; Leading You; Developing Others; and Build a Team Through Coaching and Understanding. Watch the short video he did on behalf of the Alberta School of Business. 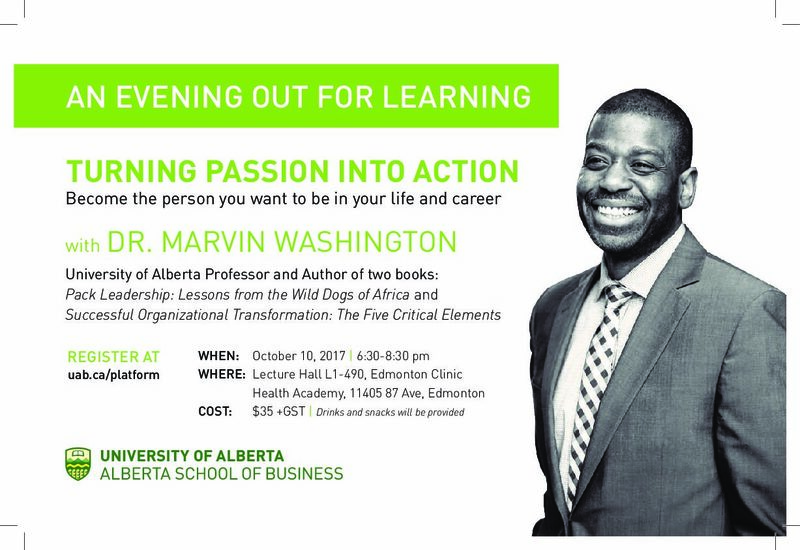 See the slides he presented at Turning Passion Into Action at An Evening Out for Learning on Oct. 10, 2017.